Update – And as we promised you, Microsoft delivered the ability to activate Windows 10 with a key from older versions of Windows with the November update. This addition will make activation a lot easier for users who have yet to upgrade their systems to Windows 10. Namely, you don’t have to upgrade from previous versions of Windows first to get a product key, as Microsoft will now recognize your system license, and provide you with a “digital entitlement,” which will make your installation of Windows 10 fully legitimate. The new build for Windows 10 has been released recently, and it brought some changes, both visual and system related. Besides other additions like Skype Messaging and Video apps, the new build also brought a highly-requested ability to activate your Windows 10 with a product key from your previous Windows 7, Windows 8 or Windows 8.1. “We have received a lot of feedback from Insiders on making it easier to activate Windows 10 on devices that take advantage of the free upgrade offer to genuine Windows by using existing Windows 7, Windows 8 or Windows 8.1 product keys,” wrote Gabriel Aul, engineering general manager for Microsoft’s OS group, in a blog post on Monday. And Microsoft indeed received ‘a ton of feedback’ on its support pages dedicated to Windows 10 activation errors. There were a lot of threads and more than a thousand messages about it. People were wondering why they’re not able to manually activate Windows 10, if the automatic activation fails, like they could in previous version of Windows. 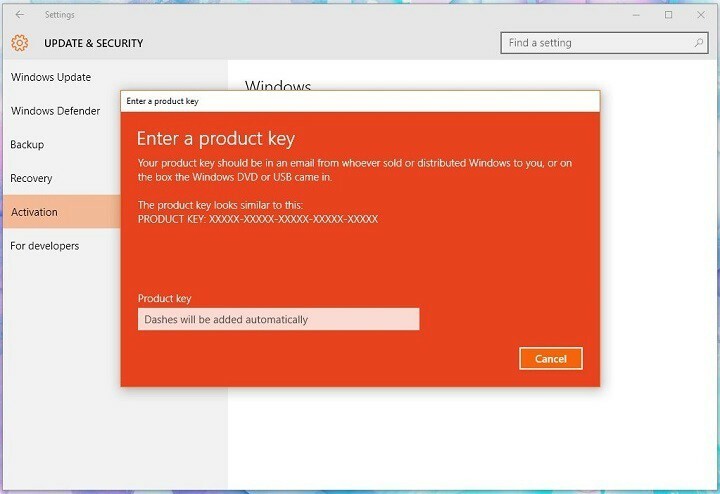 Besides using your valid Windows 7 or Windows 8.1 product key for activating Windows 10, if you install Windows 10 on a computer that has integrated product key as a part of its firmware, Windows 10 installer will locate it, and it will install fully-activated version of Windows 10 on your computer. “If you install this build of the Windows 10 Insider Preview on a PC and it doesn’t automatically activate, you can enter the product key from Windows 7, Windows 8 or Windows 8.1 used to activate the prior Windows version on the same device to activate Windows 10,” said Aul. Activating your version of Windows 10 with a prior-Windows 10 product key isn’t different than activation with a regular product key. You just have to go to Settings app, and then to Update & Security, Activation and just click Change the product key. This is a great addition, but it still remains just a promise, as Microsoft still didn’t release the ISO file for build 10565, so we’re unable to check if activation with product key of prior-Windows 10 version of Windows works. Microsoft will deliver this update update to non-Insider users on Windows 10’s Current Branch (CD) by the end of the year. Microsoft already told us that it will release CB updates on every four months, which means that it will arrive sometime in November (four months after July 29th). But for those of you who are in the Insider Program, you can download the latest build 10565 with this feature from Windows Update now, but only if you’re on the Fast Ring.